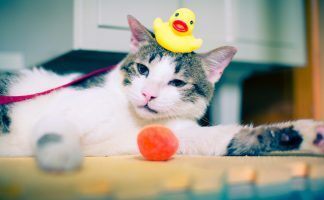 When you have a large cat – or cats (or cats that need a lot of exercise) it’s often hard to find equipment that will not only support their weight but be sturdy enough to let them get the exercise they need. This is among the larger cat trees: at 50″ by 26″ and at 72″ high, your large felines will have all the space and comfort they need – away from your furniture. It has plenty of advantages, many linked to its size.Like the Armarkat tree, it has plenty of options if you’re handy. Its sisal scratching posts will keep your cats busy – and they’ll prefer them to your furniture, which is a good thing. The Merax also has many “extras” – two hammocks, lots of scratching posts, a condo, a shelf, a tunnel and a ladder. You can also remove the lower hammock if kittens will be using the tree until they are fully grown. The strings holding up the hammock could be dangerous if kittens are caught up in them. If you have the space (this is large so measure carefully!) 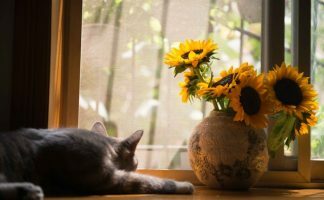 you can also add some fake but natural-looking foliage and make the cat corner into a mini-forest by adding cat-safe natural foliage or artificial varieties. This is a large, traditional-style cat tree for the money, with faux-fabric rather than carpet so if you have a designer home, consider that foliage cover and don’t make this cat condo your room’s centerpiece. Once the cats have shredded the tree – this will happen to most trees over time – you might consider reupholstering to something more in tune with your decor. While with this cat gym you’ll have to overlook a few imperfections, you’ll be giving your cats a fun play structure that is great for its price point. With many levels and scratching posts your cats will think they’re in heaven! 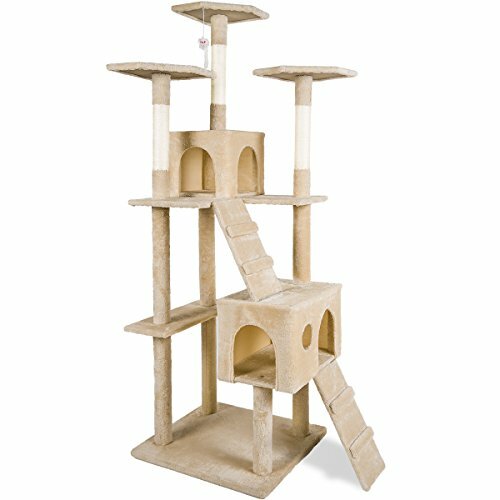 The Merax Cat Tree Condo is certified by the California Air Resources Board (CARB). This is an environmental agency that tries to limit formaldehyde emissions from composite wood products. ✓ A lot of cat tree for the money!